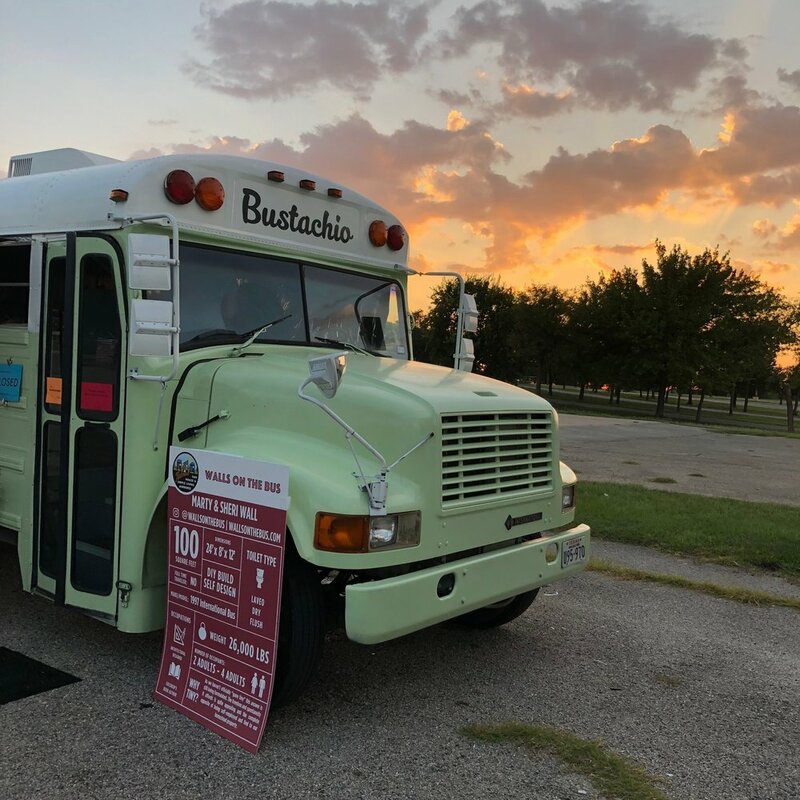 When Marty and I started our skoolie conversion, our goal was to be ready to show at the Austin, TX National Tiny House Jamboree DIY Village. With just minutes to spare, we made the check-in deadline at our destination for the weekend. I had envisioned a leisurely Friday morning before our departure - a big breakfast, pedicures with my nails painted to match Bustachio’s exterior, lots of contented exhales and warm fuzzies of accomplishment shared between us. Didn’t happen. We barely got showers and everything loaded inside before heading into Austin traffic. The ride there was uneventful. I got used to the gentle, rhythmic bouncing and let my mind wander to my elementary school bus-riding days. Marty did a terrific job handling Bustachio in traffic and enjoyed returning waves and smiles to passersby. Once we parallel parked into our designated spot in the DIY Village, we took a few deep breaths and headed over to our mandatory exhibitors' meeting. Everyone was so warm (literally) and friendly as if they’d known us all their lives. Many of us were followers of each other’s Instagram accounts and have been watching the projects and journeys leading up to this date for a while. After all the must-dos were done, some cold drinks and adult beverages appeared, laughter and story-telling ensued, and a good night’s sleep was had by all. Ten o’clock in the morning seemed to arrive at seven. Even though the heat and humidity were already uncomfortable, guests arrived in a steady stream. Some were just thinking about “going tiny” and were trying to decide between a home, skoolie, or a van. Some were in the throws of their own builds and came in search of ideas and inspiration. Some were skeptics who were pleasantly surprised. Our family delivered P.Terry’s burgers for lunch, and many dear friends came by to see us and Bustachio. 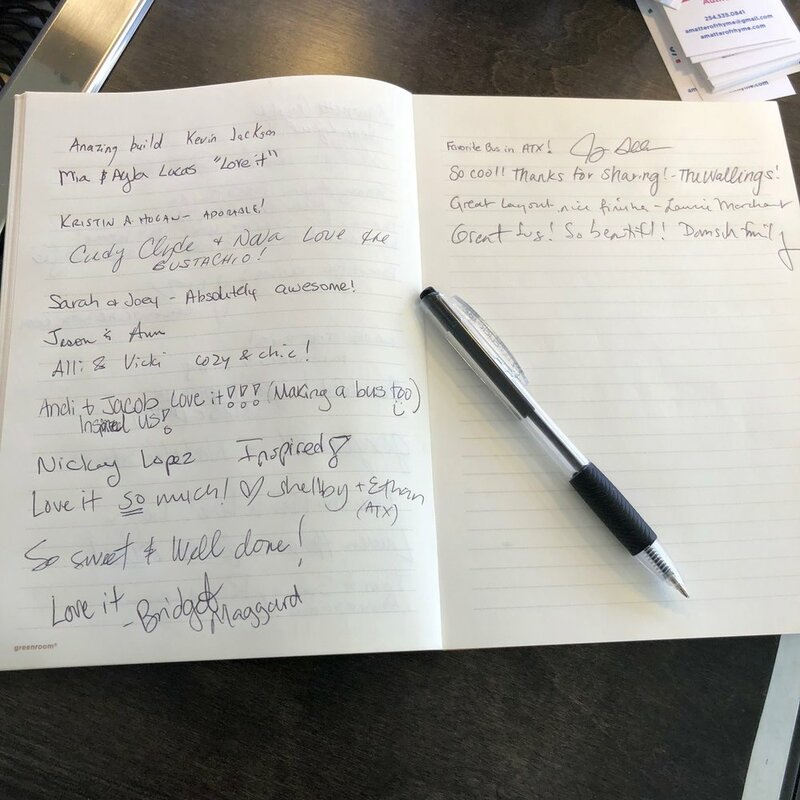 At times it was a bit overwhelming, but with comments in our guestbook like these, we couldn’t help but keep going. As the tour closed to the public on Saturday, the DIYers traded funny anecdotes and comments from visitors, relaxed in our folding chairs, and relaxed in our folding chairs. Did I mention we relaxed in our folding chairs? Hunger finally took over and those that were able shared a dish or two for a delicious potluck dinner. Drones, electric skateboards, guitars, and reckless golf cart rides brought the evening to a close. Sunday wasn’t quite as steamy, but our curious and complimentary company just kept coming! It was very rewarding to be able to connect with people of all ages and backgrounds and give them tips, encouragement, pointers, and a smile. That’s what the growing tiny living community is all about. Folks helping folks. We not only served our guests, we DIYers helped each other in the form of food, supplies, showers, muscle, information, and open hearts in general. It was genuinely organic, instinctive almost, and refreshingly uplifting in a down-home kind of way.